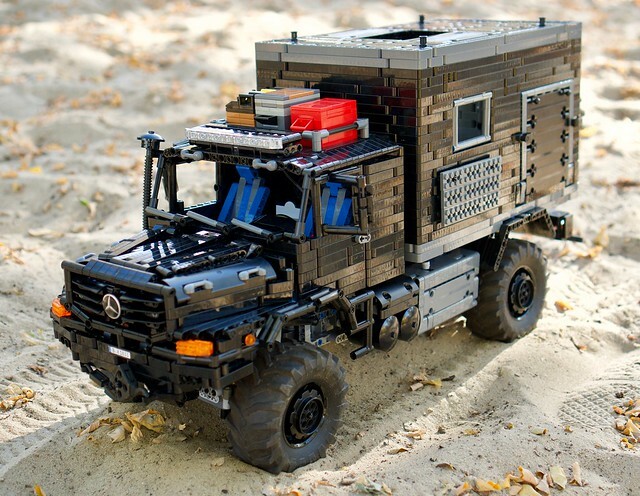 Deep forests, hot deserts, hostile Arctic or lively jungle: No problem for the Mercedes Zetros 1833. 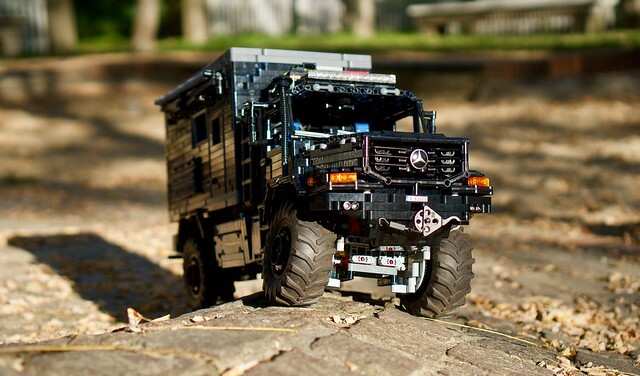 The Mercedes Zetros 1833 “Expedition Truck” is my second LEGO Technic Zetros in an approximate scale of 1:13.5. The construction time was actually only three weeks. Then the truck was finished by and large. The extensions and improvements took another 11 months. 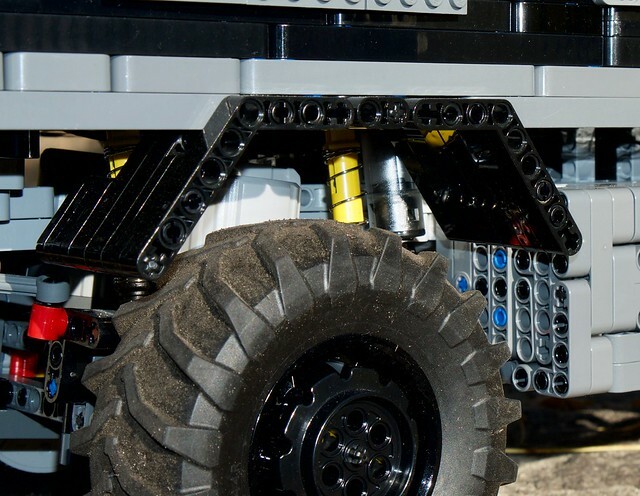 This MOC was originally designed for lightweight construction, best off-road capabilities and adequate speed. 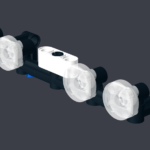 Therefore I completely redesigned the chassis and the axles. And because it has to work in forest, desert, arctic and jungle, I designed the chassis and drive as simple as possible. 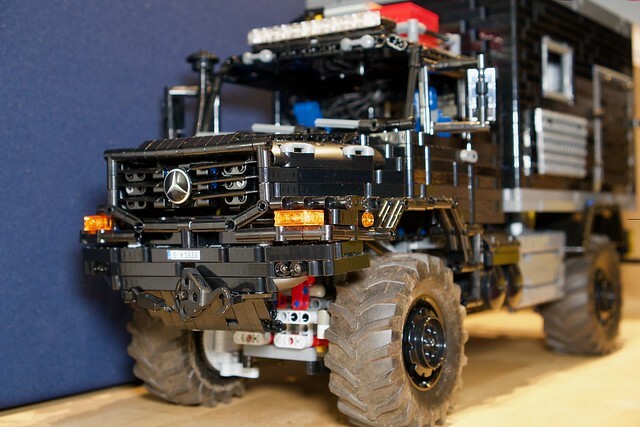 Each wheel of the 4×4 truck is driven by an XL engine. Via a 90° deflection via knob wheels, the drive goes to planetary gear. Thus the highest possible torque is available at the wheel. The steering is done by a servo motor. 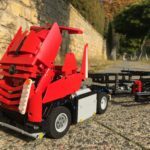 Two SBrick are used to control the truck. In addition, a Power Functions infrared receiver is installed. The Zetros draws its energy from two large PF battery boxes. The lightweight construction was not quite successful. The Zetros weighs 5.7 kg including batteries. Therefore I had to reinforce the springs several times. Now the long red springs are in front ( a bit softer ). In the back there are four yellow, hard springs as well as two spring-loaded shock absorbers. The shock absorbers were necessary because the body quickly built up during off-road driving. So the truck is very stable and easy to drive. About the functions: At the front of the Zetros there is a cable winch with pulley and hook. 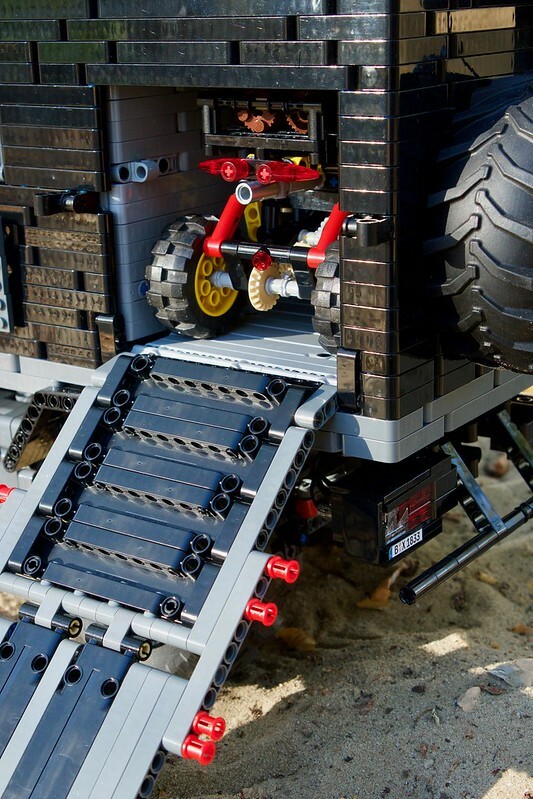 The winch is operated via one of the SBricks. 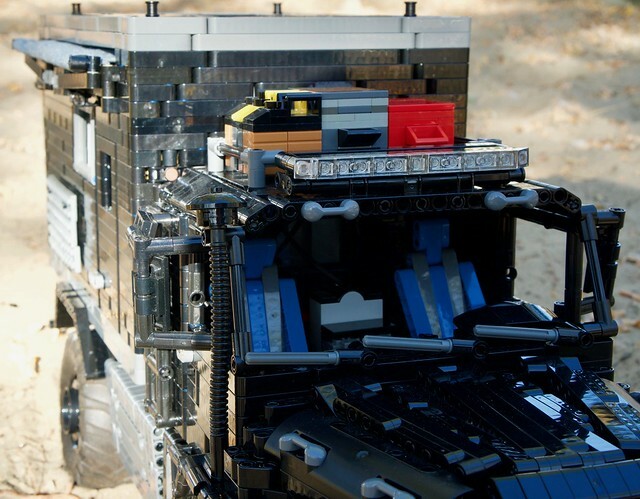 In the rear of the fully equipped superstructure there is a garage for an ATV. I control its winch via the PF IR. 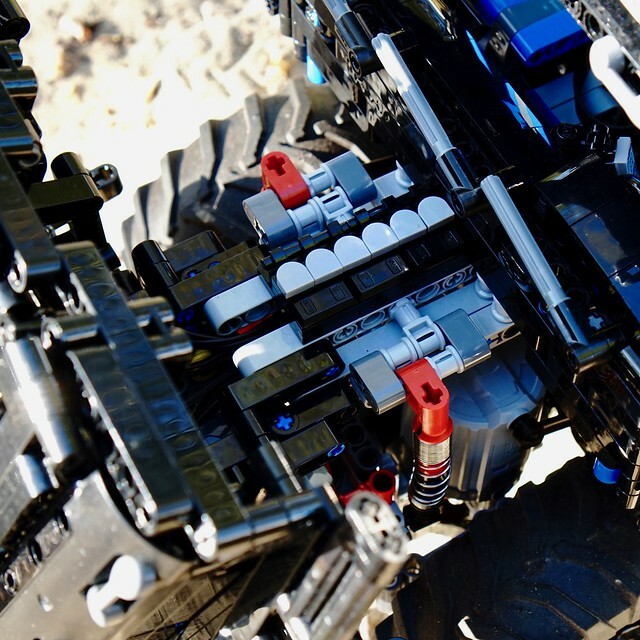 The ATV is quasi a “MOC in the MOC” and of course fully functional. It has a fake V2 engine and rear axle suspension. For a long time I worked on the retractable awning. This stretches itself. 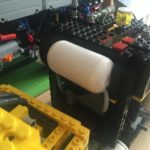 The motor, which is hidden in one of the built-in cabinets, only rolls in and out the fabric. The awning is also controlled via the PF IR. A real highlight is the lighting of the truck. Functioning front and rear lights go without saying. The indicators also work on the left and right as well as on the “warning lights”. There is a floodlight bar on the roof. And because it is equipped with an odd number of single LEDs, there was one left. Well, now the truck even has cabin lighting. For interior design. There is a passage between the driver’s cab and the superstructure, as in the original, which is covered at the top and sides with a flexible rubber bead. 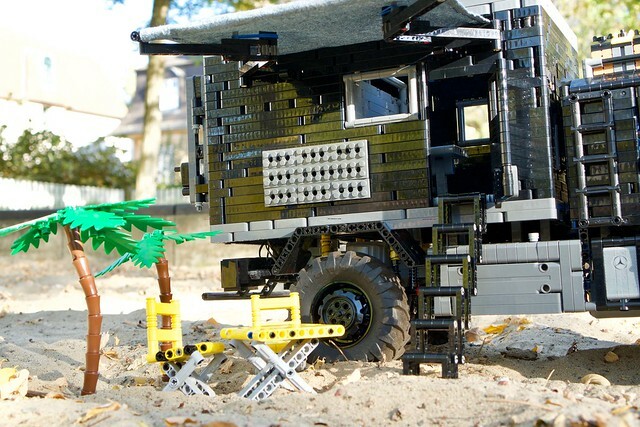 In the living area there is a loft bed (above the ATV garage), a small bathroom with a suggested toilet, a suggested kitchen block (which hides the winch for the ATV), a closet (which hides the mechanics for the awning), a table and two storage compartments (one is empty, the other contains the awning shaft). On the roof of the driver’s cabin is a luggage rack with two expedition boxes (what’s inside, I reveal in the Behind-the-MOC video) and three canisters of water and diesel (what else). I hope I haven’t forgotten anything. More photos of the finished Zetros 1833 and the Work in Progress of the Zetros can be found on my Flickr channel. Amazing Build!! Any chance you plan to sell the instructions for this AWESOME vehicle. thx a lot. At the moment I don’t plan to release full instructions. I thought about making instructions for the cabin and the hood so everybody can built it’s own Zetros. But as more and more people ask for I tend to say, maybe 🙂 But first I have to find time to do so. I understand, takes time. I try and build what I see and then make the instructions so I can build it again. Wish I could help you out with the instructions. Have done that for several folks in the past. Look forward to the day you might have them. 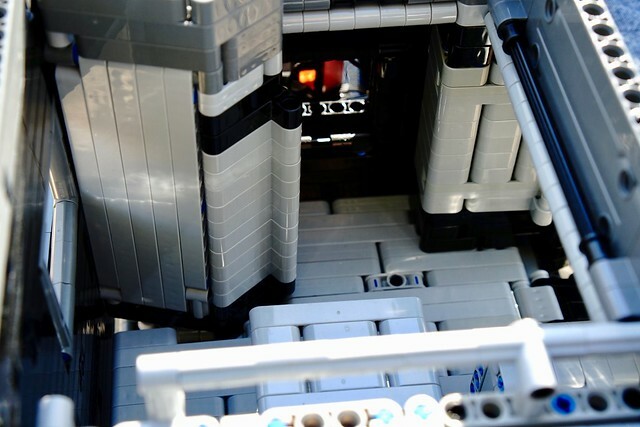 But again, very nice build and you should be proud! Have a great holiday season. thx for your comment. You wrote “Wish I could help you out with the instructions.” Maybe you can. Let’s talk about that. Wish you a mrry christmas too! Contact me anytime at my email. Already done. Maybe my mail is in your spam folder.